This Rampant Lion Medieval Heater Shield will transport you to another time. It was a common sight to see a knights heraldry emblazoned on his shield in medieval times. 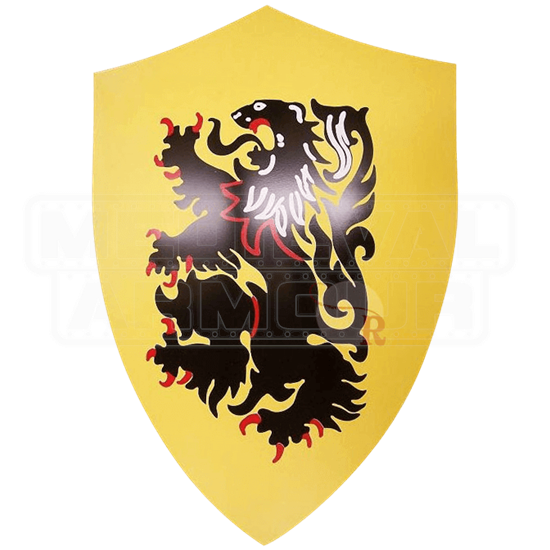 This shield features a black rampant lion as the main charge. The dark colored lion is set against a yellow field. This shield is modeled after classic medieval heater shields. The lion stands aloft of one hind leg, while the other appears ready to attack. Its jaws are opened wide and its tongue is out. This shield does not have an overly ornate design, but it makes a great display piece that you can hang on your wall for some daydreaming inspiration.